Bargain steel .223 Rem ammunition that can be digested by most of the semi-automatics aside from the super tight ultra-match guns that have trouble keeping premium rounds feeding reliably. If you know and understand the benefits and small limitations of steel cased ammunition and you do not desire to reload, these might be a perfect choice for your high volume shooting needs given the excellent price point and the level of reliability they can deliver for the average shooter. A 55 grain projectile is best mated to a middle range twist rate if you’re shooting it out of a semi-auto like an AR/Clone, something in the 1 in 8; 1 in 9 or 1 in 10 twist rate range will work really nicely. For those shooting out of a bolt action these are exceptionally reliable rounds but they do have a tendency to be a little rougher to load. They steel casing won’t damage chambers or any other mechanical parts in a firearm, but sometimes the cyclic action of the firearms using steel will seem a bit harsher than normal. 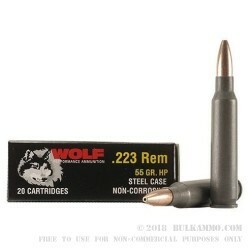 A great all around load for the heavy volume shooters and this hollow point (suitable in many place for big game work up to and including deer) can achieve 3025 feet per second velocity, which makes it suitable for a variety of purposes so pack up your AR-15 or other .223 rifle and get out to the range! The POF works vary well with this ammo no bad feeds no miss fires. Low price but seems that not for all weapons. My first 1K purchase was for 'backup' so I, stupidly, put it in storage and ordered another K to shoot. My Stag Model 8TL does NOT like either steel case ammo in general or this ammo in particular. Seems as though nobody has said that it harms their rifles so I will use it for practice and proficiency at stoppage clearing (free and not life threatening) to prepare for any REAL event. The ammo performs okay. It will jam in the Ruger mini-14 target model. It also jammed in our AR-15 Colt. While the price is great the reliability is not. Still half the cost of other bulk .223 ammo.